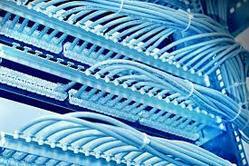 We are provide LAN Strucre cabling solution. East reasigion only feel free contact with us. We offer complete range of professional cabling solutions. The backbone of any network are the cables that carry the data, by providing the perfect solution for a requirement we make sure that the backbone is super strong. We are a renowned manufacturer, supplier and exporter of LAN Structural Cables.Designed and developed under the supervision of professionals, these are in adherence with the international standards. These cables are widely used for connecting high-speed network between required devices. structured LAN CABLING AND NETWORKING AT VERY AFFORDABLE PRICE. We have carved a niche amongst the most trusted names in this business, engaged in offering a comprehensive range of Fiber Optic Solutions. We have carved a niche amongst the most trusted names in this business, engaged in offering a comprehensive range of Structured Cabling. Passive Structured Cabling LAN / WAN implementation. In passive structure cabling we are dealing with MOLEX, AMP, KRONE, DLINK etc. the leading brands. In Active we have product line of CISCO, HP, NETGEAR etc. Structured Cabling is a backbone of a Smart Company. Konnect have always believed that Data Cabling design and installation is a job for the Specialists. Why entrust the most Vital part of your Data Communications infrastructure to anybody else.